NZ Historic Places Trust have recently located an 1842 survey map of Meola Creek source on the slopes of Owairaka/ Mt Albert. Our thanks to Steve Burgess, Craig Humberstone, Rendell McIntosh and Alberton, NZHPT. Morphum Environmental Ltd has been awarded this years IPENZ Arthur Mead award for the Environment and Sustainability (small projects) for their work on the Roy Clements Treeway Boardwalk Project. This award is for the application of environmental awareness to the solution of an engineering problem. The award was presented at the IPENZ (Institute of Professional Engineers of New Zealand) presidents dinner this Wednesday. Congratulations to Morpheum on the award! On Saturday May 9, approximately 35 volunteers turned up on a relatively fine day to help put 2000 native plants into the ground. 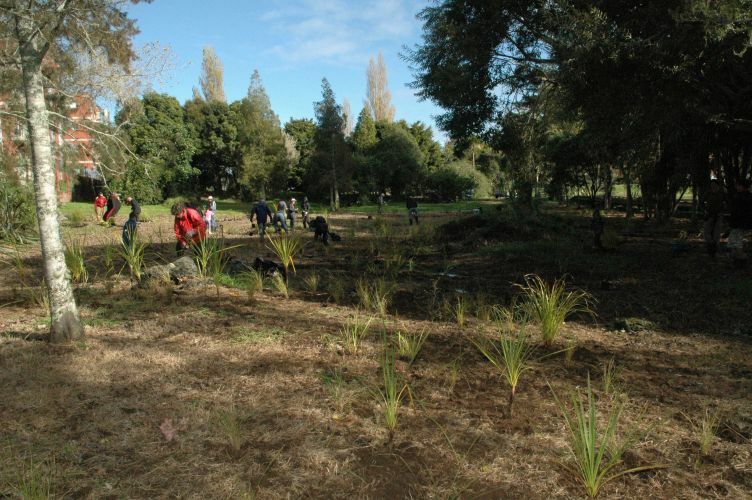 The plantings will transform what was once a neglected piece of school land into an aesthetically pleasing, functional wetland right in the heart of Mt Albert. As the plants mature, they will provide habitat and an important food source for native and exotic bird species. Meola Creek and its environs already attract birds such as tui, fantail, grey warbler, mallard ducks and pukeko, and we’re hoping the wetland will entice many other species to the area. We would like to say a big thank you to Melissa Marler (Waicare), Phillip Johansen (Metrowater), Dave Bowden (Auckland City Council), Aaron and the crew from All Drains, and all the volunteers who gave up time to do their bit for the local biodiversity. We’d also like to thank Roy Clements (the patron of STEPS) for coming along. Roy got the ball rolling many years ago by planting native species such as kahikatea, cabbage tree and swamp maire along the creek, back when he was a teacher at Mt Albert Grammar. All of those plants have grown to be large trees, some of proudly reside in the wetland. It must have been special for Roy to be involved with the next generation of plantings. Of course, the hard work isn’t over yet – the wetland will need care and attention over the next couple of years to ensure that weeds do not have the chance to smother the native plants. So keep an eye out next time you’re in the area, and feel free to pull out a few weeds on your way.